Aamod Dekhne, a student in Wayne State University School of Medicine's M.D./Ph.D. program and the Cancer Biology Graduate Program, was awarded a F30 Ruth L. Kirschstein National Service Award for Individual Predoctoral Fellows by the National Institutes of Health. The NIH's National Cancer Institute will provide $41,644 per year to support the project "Dual Targeting Cytosolic and Mitochondrial One-Carbon Metabolism with Novel 5-Substituted Pyrrolopyrimidines," through February 2019. Dekhne is mentored by Professor of Oncology Lawrence Matherly, Ph.D., who also is the director the Cancer Biology Graduate Program and Department of Oncology's division chief for Basic Science. "I selected Dr. Matherly's lab because he is an established investigator with a long track record of drug design and development. I was drawn to the potential of playing a key role in discovering the next big cancer drug," Dekhne said. Dr. Matherly's lab spans both basic and translational studies of cancer therapy, with a major focus on metabolism and the biology of membrane transporters relevant to cancer therapy and drug discovery. "Current chemo drugs often fail because of drug resistance, which necessitates the development of new drugs with novel targets. Serine hydoxymethyltransferase 2, or SHMT2, a key mitochondrial enzyme, is one such novel target that is highly upregulated in cancer, but has no clinically useful inhibitors," Dekhne added. "My research project seeks to characterize novel inhibitors of SHMT2 discovered collaboratively by our lab and Dr. Aleem Gangjee, a professor of Medicinal Chemistry at Duquesne University in Pittsburgh." Dekhne is in his second year of the Ph.D. portion of the program, which he will complete in June 2019 before tackling his remaining two years of medical school. 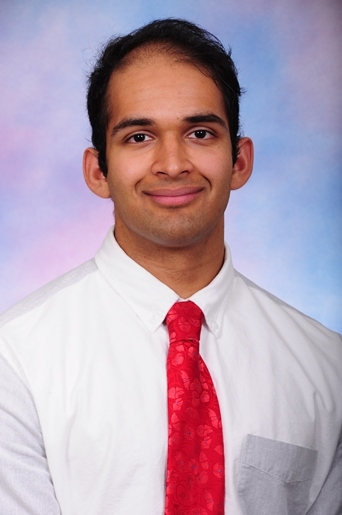 "Mr. Dekhne is a uniquely talented student who is strongly motivated toward a career in academic medicine. His receiving a fundable score on his F30 application on the first try was no accident. It reflects a carefully crafted application and his excellent credentials from his undergraduate training and the M.D./Ph.D. program, combined with the outstanding training environment in the Cancer Biology Graduate Program at Wayne State," Dr. Matherly said. "Receiving an F30 validated the impact and novelty of my research. Getting a vote of confidence from the NCI reassured me that I have a special project and to make the most of it," Dekhne said. The West Bloomfield, Mich., native earned his bachelor of science degree in Biophysics from the University of Michigan.